Today, we will be taking a one-hour flight to Lhasa Gonggar Airport which is at an elevation of 3570 metres (11,712.6 ft). It is one of the highest airports in the world and about 60 km from Lhasa city. Upon our arrival, we will be travelling to Lhasa. Today, the rest of the day is free for you to explore and accilimitize yourself to the air, temperature and high altitude. 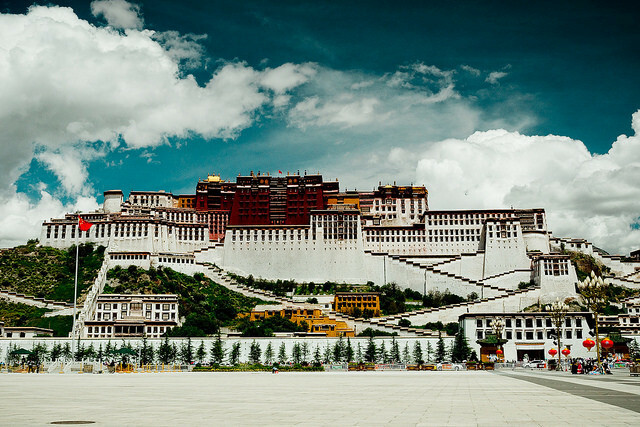 A majestic palace, a school of dialectics and the Dalai Lama's garden, a visit to Tibet can not be considered complete without a visit to the Potala Palace, a spectacular building that literally dominates the Lhasa skyline. It contains the private stays of the consecutive Dalai Lama as well as numerous government rooms and many chapels. The oldest part of the palace is of the fifth and sixth centuries. But the palace as we can visit it today is of the seventeenth century. 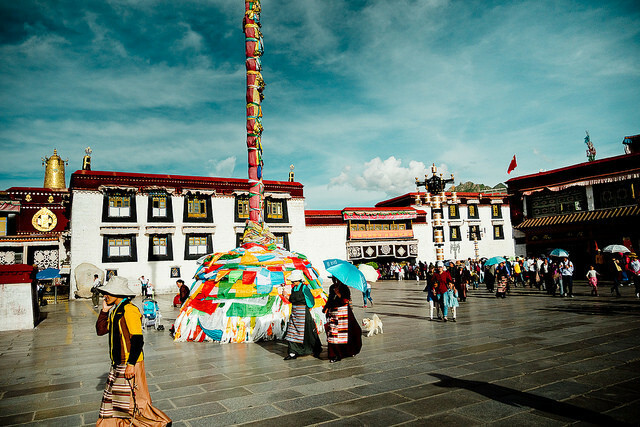 The Jokang Temple, this is the most important pilgrimage point of Tibetan Buddhism. Around the temple is Barkhor street where you can do kora (a religious circle of a building or mountain) with pilgrims and locals, in the meantime you can buy souvenirs. In the morning we will visit the Monastery of Drepung founded in the fourteenth century. For a time it was the largest monastery in the world, with a population of about 10,000 monks. Today the number of monks has dropped to several hundred, but it remains a very interesting monastery to see because it did not suffer great damages during the Cultural Revolution. Norbulinka Monastery: Norbulingka is a Summer Palace of Dalai Lama, the most famous garden in Lhasa. It consists of several palace complexes, such as the Kelsang Potrang, Tsokyil Potrang, Golden Linka and Takten Migyur Potrang. Each palace complex is divided into three sections - the palace section, the section in front of the palaces and the woods. In late afternoon we will attend the philosophical debate in the monastery of Sera, the most important Buddhist university in Tibet. Today, we will be having our breakfast at 8 am and then continue our journey to Gyantse at 8:30 am. Gyantse is 290 km far from Lhasa. The road goes along the lake Yamdrok, huge blue mirror at 4300 meters above sea level, then rises to the 5010 meters of the Karo La, a spectacular step grossed between the glaciers. We will then reach Gyantse, a small and humble town with a magnificent history. This is an ideal place for one to also experience the rural Tibetan culture and beliefs at its purest and best form. Upon our arrival, we will check into a hotel, have some rest and then visit Pelkor Chode. It was built in 1418 by the Dharma King of Gyantse Rabtan Kumsang Phag and the first Panchen Lama Khedrup Gelek. It’s a non-sectarian Buddhist center where Gelugpa, Sakyapa, and Butonpa co-exist in harmony and peace. Later in 1427, the Great Stupa Kubum was erected in the pattern of the Multi-door Stupa (Tashi Gomang), one of the eight prototype stupas of a Buddhism. Kubum is of 32.4 meters high and includes 108 altars where a hundred thousand Buddhist images are enshrined as statues and murals. Today, we will be heading towards Shigatse which is 90 km far from Gyantse. After 1 and a half hour of drive, we will reach Shigatse which is the farming hub for all of the Tibet. Here, we will be visiting the Tashilumpo monastery - the seat of Panchen Lama, who is regarded as the reincarnation of the Buddha of endless enlightenment. Items of interest inside this monastery built in 1447 by the first Dalai Lama are the relics of Shakyamuni, the hall of Maitreya and a mind-boggling collection of thankas and statues. After visiting the monastery, we will then continue our drive to Sakya which is 150 km far and takes a 3-hour drive. Upon reaching in Sakya, we will check into our hotel for rest and then have dinner. This town is small and cute and you can walk around at your own will. Today, after having our breakfast, we will be heading to Xegar. It’s a town with a population of 3000. Its importance lies in the fact that it is the center of this large and remote country also because it is the base from where expeditions to Mt. Everest and other peaks are launched. This route involves a highest viewpoint - Gesola (5248 M). After reaching Xegar, we will then depart for Everest Base Camp. Despite having only 110 km to EBC, we will arrive at Rongbuk, the last inhabited nucleus in the vicinity of Everest. 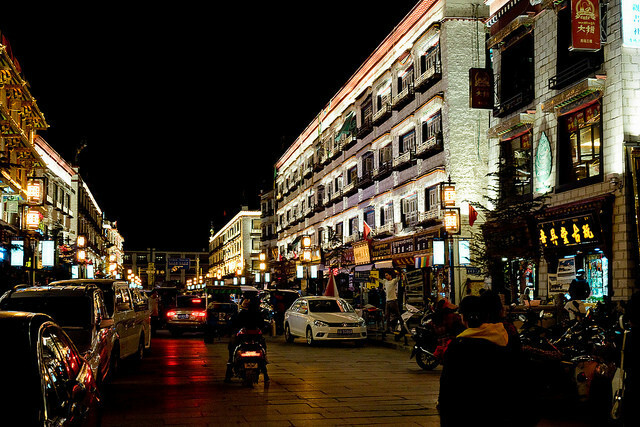 This is an esplanade with semi-nomadic shops that serve as hotels and restaurant and it’s where the Everest Base Camp is located. After breakfast we proceed to beautiful drive through a series of switchback bends the road descends to Old Tingri. The trip continues to pass over two spectacular passes: Thong La pass (5050m) and Lalung La pass (5082m), Along with the two passes, we also get to enjoy fabulous views of the high mountains including Shisha Pangma (8,013m). Stop by a lake, Yak herders, we will also be seeing Milarepa cave over the cliff on the way. It is the site of the celebrated philosopher’s meditation.Reach Sino Nepal border. DAY 8: Kerung to Border 19 km - Drive continue to Kathmandu. (140 km – 8 Hours).